Meet Lenore. She’s an undead little girl with a 400-year-old vampire friend named Ragamuffin who looks like a doll who’s had most of his haired yanked out. Lenore is good-natured, mostly, so the havoc and death of innocent bystanders around her is usually not on purpose. I loved her instantly. I’d somehow missed Lenore’s existence until I was asked to take a look at the newest compilation of strips titled Lenore: Swirlies . Yes, the name means exactly what you think it means and follows a line of similarly titled compilations including Noogies , Wedgies , and Cooties . The titles are perfect for the dark, surreal, quirky world that Lenore calls home. 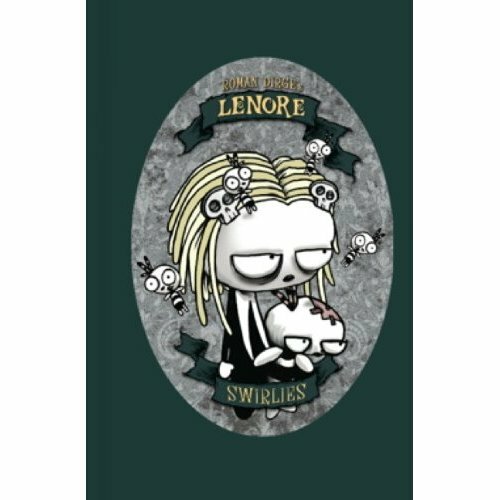 The newest hardcover, Lenore: Swirlies , features full-color reprints of Lenore strips as well as a hilarious author intro in which he contemplates coming up with a new childhood torment so he has a title for the next book. The style is morbid and creepy, but at the same time incredibly funny. Think Tim Burton movies. In fact, the author is currently working on a feature film with his dear demented Lenore, so that’s not far off. Lenore is accompanied by a wonderful collection of off-kilter characters. There’s Mr. Gosh, who looks like a sock puppet with oversized button eyes, but is actually a dead guy with a sack over his head. He’s completely, utterly obsessed with little Lenore. Also, he lives in Cupcake Castle which is inhabited by Cupcake Munchkins that bake treats like deranged Oompa Loompas. Another friend is Pooty. He’s got a bucket for a head, or a Jack-O-Lantern at times, and he carries a trident. It’s magical and lets him change into things like ponies. You can not make this stuff up, unless of course you’re author Roman Dirge, in which case it’s your job. Lucky, lucky, guy. If you like your comics dark and creepy and a little spooky, with squishy brains and crawling bugs, and cupcakes, then pick up a copy of Lenore: Swirlies . The 120-page hardcover retails for $17.95 and will not disappoint, although you may never again look at a sock puppet quite the same way.